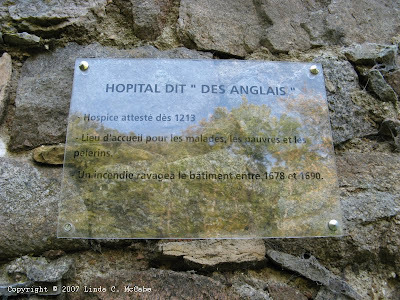 In our trip to France we visited some obscure sites. One that gets a lot of blank stares, even from Frenchmen, is when I say I visited Peyrusse le Roc. 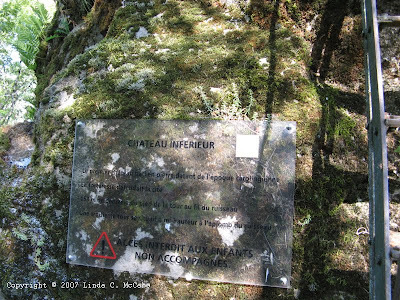 I happened to find a listing of it while browsing through the Michelin Green Guide for Languedoc Rousillon Tarn Gorges. I had been considering visiting Peyrepertuse during our trip and saw the nearby heading of Peyrusse le Roc. 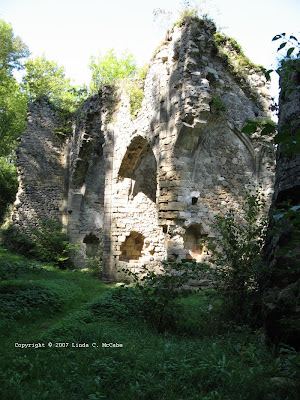 There was a mention of ruins and that the area had once been conquered by Pepin le Bref, better known as the father of Charlemagne. Ultimately we did not visit Peyrepertuse. In the guides were warnings about severe winds and safety. If the winds are too strong, tourists are not allowed to climb the ruins. The drive to get to Peyrepertuse would have been about three hours. I did not like the idea of driving that far with no guarantee about whether or not we could even climb the ruins once we got there. 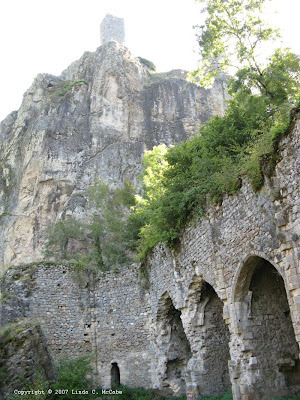 Instead, I chose to visit ruins which I hoped might date back to the eight century and had a link to the Carolingian dynasty. Getting to Peyrusse le Roc was an adventure all in itself. 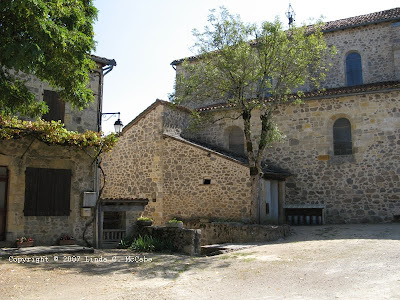 The village is about two and a half hours north of Toulouse and about half an hour south of Figeac in a region known as the Rouergue. Before our trip to France we purchased a Garmin Nuvi as well as a package of French maps. I was unable to find Peyrusse le Roc either by the site indexes or by even typing in the name. As far as my GPS unit was concerned, Peyrusse le Roc did not exist. We were left to navigate our route the old-fashioned, low tech way: maps and road markers. We kept the GPS unit on just to show us what road we were on, and at one point I laughed because it stopped doing just that. It appeared as if we were traveling overland as the D287 looked as if it disappeared. It didn't but the satellite did not seem to recognize that fact. Here is an aerial view via Google maps so you can get a sense of the area. Only upon arriving at the village did the Garmin reluctantly acknowledge its name. The village itself is small and very quiet. It was the only village in France where I did not see a boulangerie or a charcuterie. Nor did I see any restaurants. I was glad we packed a picnic lunch. 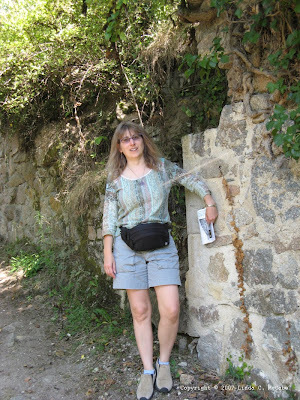 The present day village is on the hilltop and to get to the ruins, you wind up walking up and down steep grades. Over the course of that day I walked inclines more times than I care to remember. My knees and shins were complaining that day and the next. Talking with the woman in the Tourist office was of little help in my research. She spoke no English and so our communication was based solely on my limited French skills. 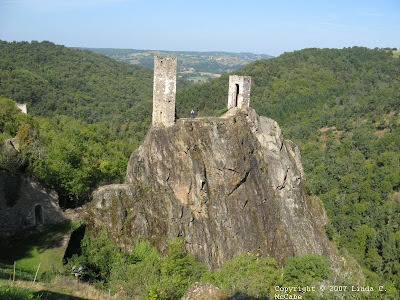 I wanted to know what was still standing that was conquered by Pepin le Bref. As I said his name, she perked up and nodded in recognition. However, I could not convey to her the essence of my inquiry. Alas, she resorted to telling me again and again where to start my tour. 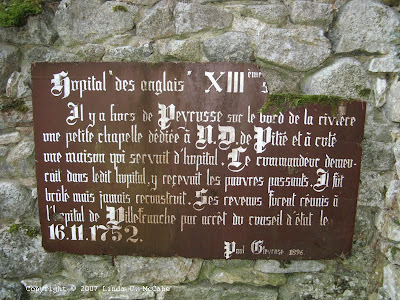 Their tourist guide indicates that the first mention of Pétrucia (a previous name for Peyrusse le Roc) was in 767 when Pepin le Bref advanced in Aquitaine in pursuit of Duke Waiffre. I discovered that Pétrucia was a previous name by a quick Google search. At first I thought it was the name of an unfamiliar historian. It is available for 35 Euros. The following is an automated translation, forgive any irregularities. At least it does not include references to convents of chocolate éclairs. 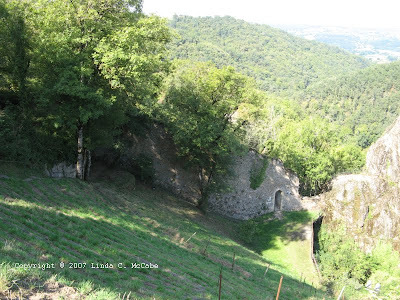 "A site as impressive as Peyrusse-le-Roc, situated at an altitude of 465 m, with the remains of the ancient and imposing Rupes Peruciae and walking paths, also riding high, has even today in early 3rd millennium, an evocative dramatic. This is even more sensitive for someone who, as the author of this work, has ancestral links with the locality, once formidable fortress, "eagle's nest surrounded by a fortified wall" is found, Indeed, the evidence in this book, a notary Gleyrose in 1598, a Mr. Jean-Louis Gleyrose, practitioner in 1778 and a citizen Gleyrose Mayor in 1793. Here, the ties of blood feeding the aesthetic emotion and passion of the researcher and we are more surprised than Paul Gleyrose, descendant of the above, we present here a dense monograph also includes the history of Petrucia-Peyrusse, origins prehistoric till the year 1900, with its colors of epic (role of the city in the war against the English), but also its demographic, economic and social (poverty of some of the inhabitants, after 1789, and "lack of relations" with the surrounding villages) and a complete and detailed portrait of the little town in the late nineteenth century, once important capital of royal bailiwick, a clear vision and contrast always faithful to the documents d 'archive. Long the city, the preferred site, named in official documents, sometimes Oppidum Petruciae, Villa Petruciae, Rupes Peruciae or Castrum Petruciae derives its power from its topography, albeit at a price of almost incessant wars, the eighth century (seat of Pepin the Short) through sixteenth (unsuccessfully attacking the Calvinists in 1568), through acts of armed resistance against the agents of the kingdom (XII century), the Albigensian war (early XIII century), the long conflict between France to England (XIV century) and the struggle of two rival factions, the Armagnacs and the Burgundians (XV century). 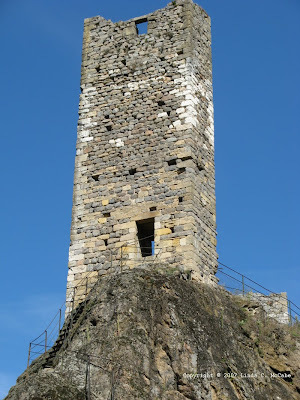 Reporting directly to the counts of Rouergue, because of its position high up, she sees her fate tied to them (from 849) until the royal sovereignty necessary, with Hugh Capet and his descendants. But from the sixteenth century, lost its place as a stronghold (discovery of gunpowder, advances in artillery, pacified regions around), Peyrusse its activity will fall until 1789, while tax burdens, they , heavy. The abolition of privileges is greeted with joy by the inhabitants, but "no drop of blood was shed (the city) during the Revolution." 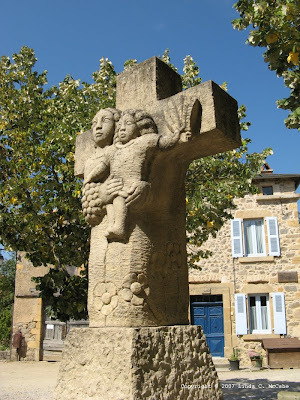 In 1848, the communal life "seems to get some momentum," the ways of improving communication: Peyrusse the beautiful, picturesque village Aveyron, becomes little by little, aflaming torch high in the past." 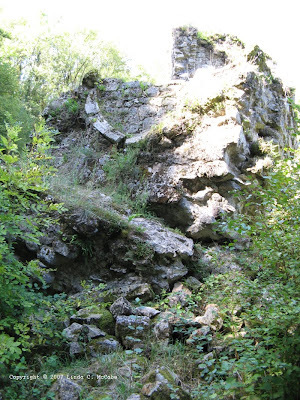 As we came upon the ruins, my husband took one look at the structure and announced that he was not climbing it. He also said that my life insurance policy was up-t0-date and if I wanted to climb it to go right ahead. I was thrilled to hear that sentiment. If you look closely you can see a rickety ladder leading up to the top of that rock. Then there is a skimpy little railing that surrounds the top portion. I decided against climbing it. I took copious pictures from beneath and did not wish to discover firsthand the wonders of the French health care system. We were told by a couple who were return visitors that on Bastille Day firecrackers are set off at the top of these ruins. I cannot imagine climbing up or down those ladders in the dark. The thought of setting off explosive devices on that summit....YIKES! Here is an even closer look at the stairs and surrounding fence. I am reprinting the top photo so you can see the brave soul standing on the top of the big rock. That was not me. Although I do think the view from up there would have been spectacular. There was an artist's rendering on the back of the tourist guide showing a wooden structure with a pitched roof between the two towers. I do not think that castle could have been thought of as spacious or comfortable. I can also only imagine how many fatalities occurred during the construction of that edifice. 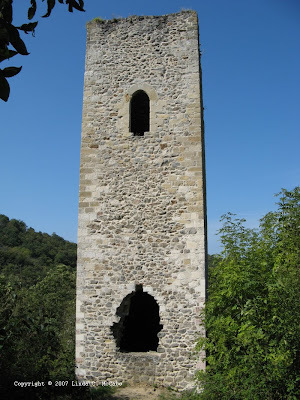 The guide also says that this iconic structure dates to the 11th century, so that is past the time of Pepin le Bref. I do not know what was standing that Pepin conquered, but most likely it was destroyed. Either at the time or over the centuries. To take those pictures I first had to walk down a steep hill to get to the base of the ruins. Beneath the structure is the sign designating it as the Château inférieur. Clicking on the photo will enlarge it for you so that you should be able to make out the words including "de l'epoque carolingienne." 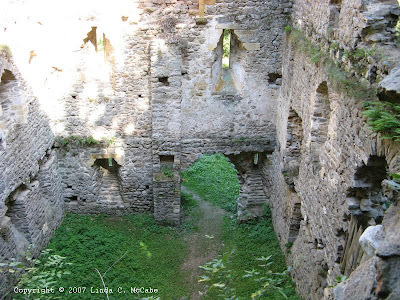 After taking my pictures at the base of the chateau, I went through a doorway in the wall that surrounded it and ventured onward and downward. 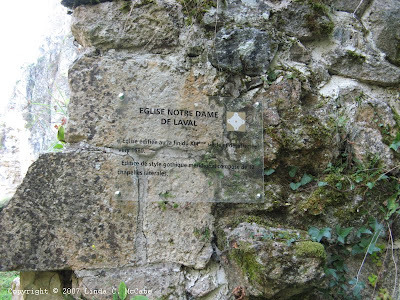 Next up was the ruins of Notre Dame de Laval. Here is the marker for that. 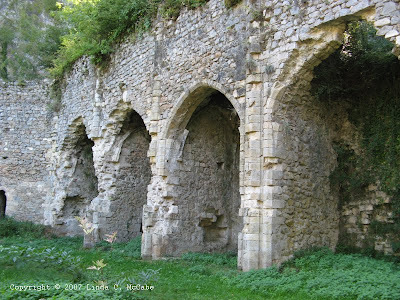 Here are ruined pointed arches that are now covered with foliage. 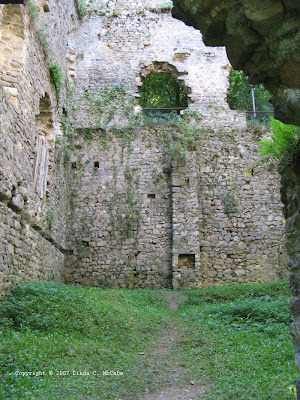 This next picture you can see where the church ruins are in relation to the Château inférieur. Just look at the top of the picture to see the familiar tower. I love this next picture because it is a jumble of stones and vegetation. As if the earth is slowly reclaiming its bones from Man. Here is another picture of the church's ruins with various shadows playing over its remains. Next are the ruins from a hospital dating back to 1213. Here are two signs denoting its significance. from another angle you can see that it is not fit for patients to be seen today. 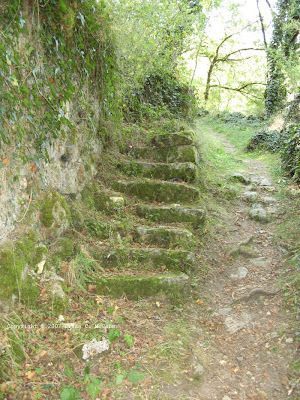 Then the path curved and I discovered moss covered steps leading back to the village. 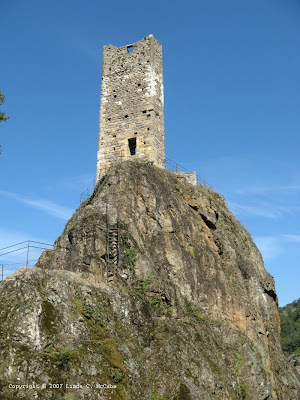 There were some structures not in ruin such as the beffroi, what we call a belfry. Here I am at the end of the day after walking up and down the hill to the village one too many times. I've heard of this but never seen such nice pictures! I love all the history too. Thanks for taking the time to research this area. I am glad you liked it. Should you decide to travel to that part of France to visit, you should consider seeing a couple other of my favorite sites. I wrote three posts about sites associated with Saint Namphaise. He's a saint in the Quercy region who according to legend was a soldier for Charlemagne. I am jealous that you're living in France! I almost feel medieval princesses will walk down those stairs, or nymphs will appear among the moss. What beautiful pictures! Thank you for sharing your adventure. I read that you are writing about Charlemagne, but am curious about the genre. Is it YA, mystery, romance, nonfiction? Glad you have found your site! Linked through Lee Lofland's The GraveyardShift. I'm glad you liked my pictures. As for the genre of my novel, it is epic historical fantasy. I imagine that they will be shelved next to the adult stories of Arthurian legend. Thanks for stopping by. Lee is a dear friend of mine. If you've met him, I'm sure you'll know why.